hjustice | Connecting people to knowledge is my passion. Change through communication. My first member story was published this month on Danny Lopez! It is so heart warming. The writing of this story was a volunteer team effort. First, I worked with Danny via email and LinkedIn to set up the tasks and timeline. I then reviewed Danny’s LinkedIn profile, and came up with all the questions about his background. He answered me in his own words. I did a round of rewriting and editorial work, and I then passed it on to the official PDXWIT.org editor for a final round. Once we agreed on the changes, the member story went to the publishing team. Once a month, the member stories are published on the PDXWIT Member Stories page. The publicity team then takes over, spreading the word. In the last few weeks, I have been exploring podcasting for myself and others, so this blog is to share a few tips with you about the first stage. I have been producing audio for videos for a number of years. Personally, I am interested in seeing if podcasting might be a good channel for producing fast, high-quality, cost-effective eLearning. In my project, I am working with two teams of people who are new to audio production and podcasting. So today, I will share with you some of the things I’m sharing with them as we travel down this road. To start, we need written content, a script, a set of interview questions, a person to interview, a theme or topic. Some people can start with an outline, and make things up as we often hear in a webinar, live radio show or live podcast. Others have a formal message to convey, so they do better with a carefully curated written script. In all of the cases I am working with today, we have good ideas for content based off blogs, training webinars, and live events. We are simply using podcasting as another way to share our message. For today’s example, I wrote a short speech about Dr. Pat Selinger for PDXWIT.org for their October Happy Hour. So, I simply reused that speech to create this sample podcast. To start, a quality microphone make a big difference. I learned this lesson the hard way. You get what you pay for in microphones. A poor quality mic increases one’s editing and recording time. A few years ago I spent about $150, and I own a professional Blue Yeti mic with pop filter. I am doing a prerecorded podcast that matches my video work, so I have my sound booth (version 3) set up in my office closet complete with padded walls and ceiling. The sound booth cost very little. It was mostly a matter of gathering things around the house to make a padded space to eliminate echo and ceiling noise. Closets full of clothing are an easy way to start. To keep it simple, I used my familiar video editor, TechSmith’s Camtasia, to produce this file. There are other software solutions for sound editing that I will explore in later blogs. Music helps the listener in so many ways, giving them auditory cues as well as bringing emotion to the audio. Professional podcasts often use music as cues in their show, and some may use sound effects to add additional interest. Sometimes, I find it helpful to restrict music use in an audio track, to only use it to cue the listener, in order to leave the narration clear and crisp. This technique can be especially important if you have a wide variety of listeners from many geographic regions. In this sample, the topic is light, and I wanted to add emotion. So, I placed the music throughout the audio. TechSmith provides royalty-free music snips, so I listened to a number of them until I found the right match emotionally for the topic. Then I brought the music track into Camtasia, and I carefully edited it down to the right length to match the narration listening for beats and music cues. I’m an amateur keyboard musician, and a long-time music lover. So, I’m sensitive to how the music sounds, and I want each fade and increase to happen at a time pleasing to the ear. It is a little detail, but one which increases the quality of the audio experience. Once I had all those pieces in place, I rendered the file in an audio-only format M4A, a process that is much faster than producing a video file. There is some debate in the podcast world about MP3 files vs the newer M4A files. My tool, Camtasia, no longer produces MP3 files, so naturally I went with what I had, M4A format. There are more details in producing a file I will cover later. For example, the actual file size is determine by the quality you select in production. I’ll speak to those topics in a later blog, because one’s choice of media server can help with these choices. Today, I published the audio file within my WordPress blog as a simple sample. I have recently upgraded this blog to a paid subscription that eliminates ads. Upgrading also allows me a small amount of audio and video storage. That is not the end of the story on publishing podcasts. There is much more to say about preparing the file, publishing podcasts on a media server, and distributing them, also voice recording and audio tips. So I will return to blog more on those topics soon! Today the eLearning Guild offered me a fun course “Strategies for Making Dry Content Come Alive” as a taste of their Pro subscription ($99 a year). Good topic! How do we take lessons that seem dry and dull, for example, legal or compliance training, and turn them around to make it more interesting for learners? I do this work often, am always interested in learning more, and I appreciate the sharing of materials and resources from the Guild. In this field, things change rapidly, and many of us work alone as the sole instructional designer or writer for our team or organization. I often go to their site to solve eLearning problems. So, I am definitely thinking of going from the free subscription to Pro to take a deeper dive into the content. As members of the Guild, seasoned industry experts share resources and host webinars all around the topics of eLearning. This group provides community functions too, for example, they conduct events, survey members and publish an annual salary survey, and host a job board. If you have not checked them out, I do highly recommend it here as well as on my Resources page. Engaging your audience is critical for designing effective documentation, videos or online training. With needs analysis, you can build the right tools at the right time, saving hundreds of hours of rework or waste. Here is a recent example. Not long ago, I was told by a leader in product development to build an internal training video on a new software feature in our software-as-a-service or SaaS offering. We had added the feature to stay competitive, and we were charging clients an extra fee for it. I found out there was only one client purchasing the new feature, a pilot client. A handful of people were engaged with the pilot client, including the product owner who already knew a great deal about the new feature. Within the largest teams, the implementation and support teams, the team leads told me this feature was simply too new to learn because it was not being used by the majority of clients. I also knew from my own experience working in software companies that a new feature is subject to change, just like the first model of a car rolling off the factory line. Based on the pilot client’s feedback, the feature itself could be very different in a few months, both in workflow and appearance. Building a video too early might mean hours of redoing and adding content later. In this case, instead of making a video, we simply made sure all product documentation was in place for our teams. The marketing team assembled a short slide deck to help our sales team explain and sell the new feature. Then we waited for client adoption. I always keep proposal backlogs, and I kept checking back every month to gauge client interest on this feature. Once the pilot client had successfully implemented the feature plus a number of clients were starting to buy it, it was time to start making the video. I engaged the pilot team plus the product owner, and we made sure the original release documentation was updated based on what we learned in the pilot. I then produced, released, and advertised the new feature video with many successful views, because it was the right tool at the right time. Building a piece of documentation, a video, or an online training course is often done without a direct connection to the audience. This may seem like an easy way to do the job. We just go build it, and keep our fingers crossed that someone uses it. I have seen this pattern over and over in different jobs, similar situations. However, there is a great deal of risk in this method, and often many hours wasted. What if we spend 50-100 hours to build something too soon, and then we have to rebuild it again in a few months? What if the new feature cannot be sold for a year or is sold to only a few, reducing the value of the product documentation, video or course? Engaging your audience and asking a few more questions before you start a large project is the smart and efficient way to go. The first college course I took at Portland Community College (PCC) was karate. I had good reasons. I was a beautiful, young girl walking dangerous streets every night. This dangerous walk was not by accident. It was part of my career plans. Throughout high school I studied English, typing, stenography, bookkeeping, and participated in a work-study program to become a secretary. The week I finished high school, I moved to Oregon to be with my boyfriend. I had a place to live with him and his family, but wanted to work quickly to support myself. His parents had two teens, a daughter and son, to worry about. Following my career plan, I started working any jobs I could land in the secretarial field to support myself. My money went to buy food, clothes, save for our own place, pay medical and dental bills, and make payments on our first car. Within a year, I landed my dream job as a real secretary to two executives at a real estate investment firm in downtown Portland, Oregon. I wanted to work in Portland for my career, not the atmosphere. Portland was a gritty city. Portland was not the mini-Manhattan it is today with good restaurants, trendy bars, beautiful hotels, and fancy shops on every corner. We had major urban blight. 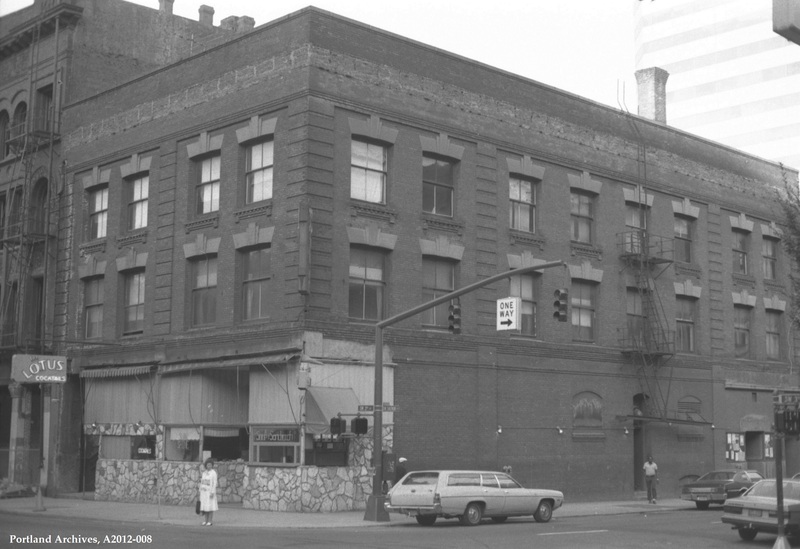 Pimps, prostitutes, and drug dealers lived downtown in low-rent motels, lingered on street corners, and actively worked their trade every day and night. Like myself, plenty of business people worked in downtown Portland, but few stayed to shop or eat in the evening. In fact, there was no place to hang out in the evening as most services shut down. Each night I walked a long 15 blocks to meet up with my future father-in-law, as he was my carpool ride home to our country house in Aurora, Oregon. I was constantly being followed by pimps who called out directly “hey baby” or much scarier silent sinister types. PCC offered a physical education class in karate after work, the perfect antidote. My “sister” and I signed up together, and bought the required white belt outfits. We quickly discovered this outfit wasn’t really designed for women, so we used safety pins to hold the top part together. Both of us were very fit from daily running, hiking or playing tennis together, weighing in at around 110 pounds each. We arrived the first day to find we were the only women in the class. So naturally, the instructor made us sparring partners. Karate was fun and challenging. It built our physical strength, and gave both of us a great aerobic workout. It taught us mental strength and agility. The 12-week class was based on defense against attacks, from behind, from the front, being punched, kicked, and so on. The instructor drilled into everyone to block, twist, defend yourself fast in one or two key blows, then run. Plus karate was credit class. It still counts on my transcript today as my physical education credit towards my degree. Yes, that first college class in karate was life-changing. Even the first week, I walked my commute in those dangerous streets a new brave woman, knowing if I needed to, I could “block, kick, punch and run”. I was inspired last month by a volunteer writing project, a history speech for PDXWIT.org on Dr. Pat Selinger, a true pioneer who changed the future for relational database work in her very first job at IBM over 40 years ago. Plus in recent years she has paid it forward in mentoring since that was the key to her success. I agree. I think highly of my mentors who helped me launch my tech career and pay it forward often. Joining professional groups requires a little research to ensure a good experience and that your money is well spent. See this article for some good tips! Written on September 18, 2018 by author Sarah Greesonbach, sharing her personal story of layoff and discovering new territories in networking. Glassdoor Blog – Should you join a professional group? I applaud speeches and efforts like this one to encourage women to enter the tech field and stay there. This mentoring work is part of my life every day. This TED talk struck a chord with me about my own actions in being brave and imperfect. I remember my own hesitation 21 years ago to try a difficult challenge, to move from business user training to technical training. I remember my mentor’s support and encouragement. I took the challenge with my mentor’s help. I learned I could have good days in tech, and bad days with unresolved problems. In 1998, I worked my first overnight session and fixed a critical problem just in time for FedEx to pick up the cases of laptops. It was on time, but it wasn’t perfect. The problem popped up again a few weeks later. I remember trying on my own in troubleshooting, reaching out for help, educated guesses, reaching out again, and solving big problems with the right people and perseverance. The big moment when I learned and taught my first MCSE course on Networking Essentials was an eye-opener. With my mentor at my side, I started to see myself as a limitless person and a nerd. I became brave and curious. I haven’t stopped since. Today, being brave and imperfect means many things to me. Trying out new tools, creating projects, and sharing the results quickly. Imperfect means accepting you have done your best, and releasing your work when the time is right. So much better than waiting, questioning, revising, and questioning yourself until you missed the opportunity, and the things you created are no longer relevant. One can always learn and revise later! Being brave means being true to my gut instincts about following the work I will enjoy, because that work makes me jump out of bed and eager to start my day. I apply for jobs when I think the fit is right, and I meet most of the qualifications, not 100% of them. I know job descriptions can be incomplete or inflated to super-star levels based on past performers, or left untouched for years with tools and practices no longer in use. In today’s world, so many people are quick to judge others based on external values and rules. I am told to hide my age, hide my valuable experiences, to write my resume a certain way, and to not be truthful in order to make it past automated screening systems, corporate recruiters, and hiring managers. However, I disagree. It is what I think about myself, my life-long learning, my skills, my successes, my interest in nerdy work, and my passion for sharing knowledge that matters. I am the sum of many experiences over 24 years working in creative, innovative, software-oriented jobs that I wanted to do. I don’t leave my career to chance. I have worked hard, often for years, to prepare for and land each job that brought me incredible insights and experiences. I have followed my heart to do what I love to do. So, now I’m looking for my next adventure. I’m a nerd, brave, and imperfect. A quick video that explores a creative problem solving technique I use often in my instructional design work when organizing content, writing scripts, or designing graphics. When I learn any new tools or techniques, I always assign myself a short project. This project started with my desire to explore the challenges in upgrading to the latest Camtasia platform. With most tools being simplified or moved to unusual locations, I challenged myself to work through each road block. I started with a text-based foundation, my previous blog Creative Thinking at 2 PM – Avoiding Writer’s Block. This project showcases graphic techniques for learning, which I found reinforced in my recent reading of a short book by Connie Malamed, Visual Language for Designers. The graphics are designed to reduce the cognitive load and allow for faster transfer of learning from short-term to long-term memory. See The eLearning Coach for Connie Malamed’s podcasts, books, and helpful blogs. Throughout the video, I strove to keep things very simple so the viewer could interpret and apply the theme to their own world. My own methods vary greatly. I might collect information commuting on a train, organize sources in Google Suite, visualize in PowerPoint or Visio, and wake up to capture bright ideas at 2:00 am in my phone. Those methods work for me. With this simple paper theme, the method should become less relevant. Each viewer can find their own way to apply the concepts. What if we thought of in terms of learner’s time when designing video content or online courses? Can we increase engagement and adoption in what we produce? In my last job, I was hired to set up a new video program for a product documentation team. A few pilot videos 20-30 minutes long had been created by the team to start the program. The pilot work included tracking production hours to show a rough relationship between length of content and production. I decided to find out what the audience needed. The learners consisted of software developers, systems engineers, and client-facing teams (sales, implementation, and support teams). Everyone had heavy workloads, so learners had just a few minutes between meetings, production tasks, or urgent client requests to watch a video. After learning about the audience’s time constraints, I then questioned the idea of a 20-30 minute video. Would viewers commit to a lengthy format for every video? Or was the length of the pilot videos a measure of success for our team before needs analysis? I then set out to establish a new condensed video structure based on our audience’s time constraints with an overall goal of 10 minutes or less for new videos. To condense content, I focused each short video on solving a core problem. I often used expert-led webinars as sources. By focusing on the core problem, it was easy to cut 30 minutes of wordy lecture to 10 minutes of video. In some cases, I restricted the video content to concepts, and then led the learner to read guides for the details. In certain cases, content proposed for one video could be moved into two or three smaller videos. My audience was dealing with a wide variety of new information daily plus many distractions, strong barriers to retention. The learners had strong need to be able to stop and start the videos or return to the videos many weeks later for reinforcement. To increase retention, I added structures within the 10-minute videos to divide content into smaller 1 to 2-minute segments. By reducing time commitments for the busy audience, I was building videos with concise, focused, quality content. Learners and their leaders commented with enthusiasm on the short value-packed format. In our reports, I could see how much viewers enjoyed the content. They would often watch one small video, then voluntarily watch a second or third video in a row. I found a few side benefits on the production side. With a shorter format, I could ensure steady stream of new releases and revisions. Experts were more likely to participate in quality reviews. Plus I found locating and reusing content was faster in smaller project files. Redesigning for the learner’s time constraints turned out to be a win-win for myself, my team, and for my audience. Choosing a free video platform for screencasts? Chris starts with the basics in flow and comparison charts, for example, which platforms allow commercial content. Plus he delivers helpful background information like explaining the high definition video problem, that is, how some platforms substitute low resolution versions that may fail to preserve clarity on screencasts and PowerPoint slide graphics. Low resolution might not matter on a cat or dog video, but it can make an educational video useless. Revisions are a natural part of managing any video library. We all want consistent content that is easy to manage and distribute, so Chris reminds us of a few key points. Can you replace videos without disturbing the URL? How about the ability to create private links or password-protected links? Many of us highly value the ability to create draft storyboard videos or to share our content in a limited manner when conducting expert or peer reviews before the final release. Most of us choose our video platform in order to store and deliver large video files, and our content needs can escalate quickly. What level of storage works for you? Is retention length for inactive content a concern for you? Knowing your intended audience and what they expect helps us make better choices. Do you want ads or monetization? Does your video contain copyrighted material? Do you need a platform with a large consumer audience and analytics? Overall, I found this TechSmith article a compelling read that drew me in with the three platform comparison, and kept me engaged with the facts and figures. Many thanks to Chris Larson for writing it, plus to Wendy Hamilton at TechSmith for sharing it on LinkedIn. Put on Your Gloves…Portfolio Time! This past month I was reminded by several people of the importance of an online portfolio. How does one find the time? It’s tough. I understand. The past year for me has been spent purging my old home, looking for and buying a newer home, dealing with endless contractors and repair nightmares to fix both my old and new homes to a decent state, selling my old home, and lots of moving stuff. I am happy to be in one home now dealing with those contractors at a slower pace. I am still surrounded by unpacked boxes as I launch my next portfolio project. On the other hand, why put it off? It’s time to put on those gloves and start again. Today I organized my workshop into a set of easy-to-follow pages. Start here, and see where it takes you! Good luck! When you are ready, seek direct and honest feedback from one or two trusted individuals on your portfolio pieces. Tell them your intent for the portfolio piece, any concerns you may have about it, and request that the reviewer does not hold back in their review. Give the reviewer a private way, messaging or email or phone, so they can respond honestly. I have found peers to review my portfolio by keeping in touch with former coworkers, and friends who are in a similar line of business. Those who have been to college recently may find a few trusted classmates or a former professor willing to act as reviewers. When you ask someone for feedback, you are asking them to spend time on you and your personal project. If you have a personal close relationship with the person, you already have a good foundation in place to ask for an opinion. Remember, there has to be something in it for them, when you ask a favor. You may have to ask more than one person to review your work. Be prepared for a “no” or those who do not follow through. Some people would love to help, but they are simply overwhelmed with their own lives. Don’t be offended if they cannot find an extra hour or two to give to you. Others simply do not care to become involved; it is not their nature to help others. There are those who are willing and can give, and those who cannot. To find a person willing to give and be a reviewer, look for those people who give consistently in different ways, volunteering at work or in their communities, taking the time to lend a hand to someone less fortunate, often going to lunch or coffee to share business experiences, taking time to ask others about themselves or their families at a party or business event. By observing these sharing and caring behaviors, you are likely to find an honest and willing reviewer. Since you are asking for a favor of time, it helps to make the experience reciprocal for your reviewer. Find a way to pay them back for their time. What would they like in exchange for them reviewing your portfolio? Can you offer to take them to lunch or dinner or make a meal for them? Perhaps you will help review their resume or LinkedIn profile or their portfolio piece? One of my former work friends asked me to help her with an Access database project for a couple of weekends. She knew I was short on funds due to being out of work for a while. In exchange for my work, she offered to take me to lunch. At lunch, she gave me a beautiful card with a small cash gift. I had helped her succeed with her project, and in return this personalized thank you meant a great deal to me. It left us both feeling good about the experience. We have helped each other a several times since that point, and we ended up traveling the same roads as instructional designers. Today, I mentor young women often. Many of them offer to buy me a drink or meal in exchange for a mentoring session. This makes me feel appreciated, and it creates a pleasant memory for both of us. When you ask for feedback, it may not always be what you expect. Be open to understanding what may be wrong about your piece as well as what may be right. I remember one very self-involved woman I met a local networking event. After talking with me for about 5 minutes, she asked if I would review her online presence in her LinkedIn and Twitter accounts to help her figure out why she might be having difficulty landing interviews and a job. At first I was inclined to say ‘no’. I didn’t know her. I was not invested in her enough to give her a few hours of my time based on a rather one-sided conversation all about her. But then I thought about it. Change through communication is my motto. I realized I could be a good person to do a review with outside, unattached eyes. I was not likely to be involved with her directly in a job situation, like an interview or to act as a reference. So I agreed to do the review by email. In my review, I discovered a few positive things, like recent education and an interesting work background. I also uncovered that this person had some red flags in both LinkedIn and Twitter. Her LinkedIn profile highlighted a job title of Data Scientist, yet her education and job experiences simply did not show why that title made sense. In looking at her Twitter feed, I saw a series of monologues, mostly complaints. There was little dialogue or interactions with others, either individuals or businesses. I wrote her explaining the positives and the negatives directly in a private email. I wasn’t surprised when the women failed to thank me for my time reviewing her online presence. For a few months, when we saw each other at more networking events, she avoided speaking with me. About a year later, she finally let me know that I had actually helped her. So do always thank those who help you, even if they tell you something that is painful or difficult to hear. Wouldn’t you rather know the truth and make a change, learning along the way? Sometimes reviewers may be hard on you, because they don’t know how to soften it the blow or find the positive pieces. I have had a few bosses like that. If you think the reviewer’s opinion is skewed or too one-sided, ask for a second opinion from another reviewer, and share the results from the first one. Between the two, you may obtain that accurate picture. Today, I do a lot of mentoring, and I ask for a quick thank you as my main rule. People will often do that in person when we talk, but will fail often online. I let them know I will send them information, and all I ask is that they simply thank me. They don’t have to explain what they did with the information, but if they fail to thank me, my help and offers of information will cease. It’s a good arrangement. Once you have created your portfolio pieces, the next step is to advertise it. It is in the advertising that you may encourage discussion or feedback as a short-term event. Reciprocal behavior is the nature of most social media communities. The techniques I learned for Twitter seem to work well on most social media platforms. When I follow someone on Twitter, I am saying I’m interested in what they have to say, either what they share or their skills or their line of business. My behavior of following someone on Twitter often causes them to follow me back. In Twitter, it is considered poor form to constantly be tweeting about yourself. Celebrities might use their Twitter handle this way; it doesn’t translate well to the rest of us. The recommended practice is to share and thank twice as much as you tweet about yourself. This means you might tweet about your new blog or piece, but then you should follow that tweet with two other tweets either sharing resources you found or responding to another person’s contribution. This pattern of sharing other’s work and thanking others for their contributions establishes trust and community with your followers. You don’t have to do this every hour. If you only lightly use a platform, it is okay to spread the tweets, posts or updates out over a few days. Just remember when you say something about yourself, then it is time to appreciate and share other’s accomplishments. The nice thing about advertising a blog or piece on social media is you can catch people’s eye in a controlled manner. If your followers like it, they may share it with their followers, or they may privately message you with feedback. I like sharing in LinkedIn with 300 like-minded people; they do give me feedback. Sharing in Twitter is fun too, but with a wider less connected audience, the feedback decreases. This type of sharing means most of the feedback will be in social media, as an event, away from your publishing platform. Since the life of a Tweet or post is often a few hours or days, the sharing and feedback isn’t permanent, but it is often helpful. You may hear some good advice to help you change your piece. Instructional Design Portfolio – Private or Public? It’s your first time trying a new skill or tool, and you are not sure how it will come out compared to the professionals who have used the tool for a long time. You want to bounce your portfolio ideas off others and refine the piece. You have chosen a subject that makes sense to a specialized line of business. Most of us start with private portfolio pieces, and we slowly move toward making them public. My first few portfolio pieces were private. I produced sample courses in a PDF to showcase my writing skills. I created a 10-minute course to teach in a panel interview by extracting content from longer courses. These examples were good practice. I had to choose a subject that was understood by a specific audience, and I was forced to adapt my work to fit a much shorter format. Private publishing is often available in many hosted formats. Let’s take the example of a video. YouTube gives you the ability to privately publish videos. You can test out your ideas and see how they look, e-mail the link to your friends for review, or show it to your family or significant other. You can keep working on it. When you are happy with your final video, then you can publish it for the public. I do the same thing with my blog. I can draft it privately, and look at it for a day or two until I’m ready to publish it. This gives me flexibility in changing and fine tuning the content. Collaboration tools like Google Docs or DropBox can be helpful. You can create documents, and invite others to share your work. You can collaborate by email, phone or video easily. As you gain confidence with private portfolio pieces, the next step is to share with an audience you do not know personally or intimately. I’m here! Where are all the followers? It is important to understand that putting your work on a large publishing platform does not necessarily guarantee an instant audience, a following or even honest feedback. Very few people go viral. Understand the nature of each platform. For example, YouTube is huge and popular. I do publish videos on YouTube, but mainly because I wanted to understand the benefits, limitations and techniques used on that publishing platform. The number of topics and publishers on YouTube is so vast. It didn’t take me long to realize my videos were simply a drop in an ocean of information. I have a hard time finding experts and their content on YouTube directly; it is just too big. To me, YouTube is a good a video hosting and publishing platform, but not where viewers find me. I still have to drive viewers to my videos through my blog, social media or direct emails to those who are close to me. SlideShare.net has turned out to be a much more rewarding, controlled publishing platform for portfolio pieces. SlideShare attracts many business people and educators. It is easy for me to find experts and examples on SlideShare, and it is easy for people to find me. As you look at each platform, get to know the tools and think ahead to the end result. If you are going to publish your work on X platform, then what is the ultimate end to that publishing? What keywords would you use? How do you categorize the information so it can be found? Who are you looking for in that community? Who else shares with your intended audience? Being reciprocal is the nature of many platforms. This is something WordPress does well. When I started publishing my blog on WordPress, it was helpful to be in a community dedicated to blogging. I gained a small following from other bloggers on WordPress. Every single time I picked up a WordPress follower, I could immediately check out their personal blogs. In most cases, the blogger had found me through the keywords and categories from my posts that matched their content. So then I started actively searching for other blogs that discussed the same things I did. Once I found the like-minded bloggers, by following them, they followed me. Some bloggers compile content from others; I was pleased to be picked up in a few of these compilation posts. Commenting is a bit of an issue when you publish online for the public. We have all seen what happens in Twitter when people start going at each other. People are often more rude online than they would ever be in person. Letting the public go at your work with no filters may not be a good idea if you plan to use your blog as a showcase for a potential job. Most blogs or hosting sites offer moderated commenting, where you may review comments before they are posted. Most hosting sites, like YouTube, allow you to turn off commenting completely. I noticed in WordPress, a certain percentage of comments may arrive because others are interested in advertising their business on your blog. Fortunately, WordPress gives me tools to help with these comments. I highly recommend moderating or eliminating comments on portfolio pieces. One of the easy ways to accomplish going public is to work within an established community that practices sharing like a LinkedIn group. LinkedIn groups of your peers are a powerful place to share information. In LinkedIn, we connect with peers and coworkers for the purpose of business networking. Within LinkedIn, groups are established for discussion and sharing of information. In some groups based around a tool, we often open up discussions around examples or problems. Start by observing each group, reading what ground rules must be observed, and the nature of the posts and discussions. Once you find a group compatible with your portfolio topics, you can bring in a piece that solves a common problem for the group or you can open up a discussion around problems you are solving for your piece. In the dialogue with your peers, you are likely to gain new insights. Don’t forget to look at their discussions and posts too. If someone shows interest in you, then you should do the same. Some LinkedIn groups go live and take the whole selling you to a new level. When I was job hunting, I found a Portland area LinkedIn group designed for business people with an in-person networking element. The group existed online for discussions and sharing for individuals and businesses seeking work. Once a month, the group met live on a weekday morning. The format was simple; we placed cards in a bowl as we entered. Then we went around the room with 35-50 people, each one of us giving a quick 1 min. elevator speech about what we had to offer an employer or a customer. A name was drawn from the bowl, and the winner was invited to speak for a full 10 minutes on their pitch with the group prompting them with questions if needed. The meeting ended with an open networking session, where people walked around and chatted further with those they were interested in meeting based on the elevator speeches. At this point, people exchanged cards, and they could take their common interests to a new level at a later time through coffee meetings, emails or online collaboration. This is where I met Patrick, the graphic artist who collaborated with me on a portfolio piece, as well as Ashley, a local stylist, and Rachel, an attorney with a technical writing background. Every one of my conversations with Patrick, Ashley and Rachel turned out to be beneficial for the both of us. Groups like Portland Connect work. Look for them. For portfolio, keep it simple. Give people one spot to go check you out. Have you ever been hammered by a business that tells you to connect with them on Twitter, LinkedIn, Facebook, and other forms of social media? I have worked for a few companies that do this. The truth is only a few people will connect to a business on Facebook. Some may connect on LinkedIn, and others may only connect on Twitter. Many of us may not connect at all on social media, but we will use the company website. So in this story, what is it that brings all the social media together? Why is the business bothering with all that stuff? Social marketing is really just a push and reminder, to keep the business in your mind so you will come to the business when you are ready to purchase. If you are not yet ready to start a blog, your one spot could be your LinkedIn profile. LinkedIn allows you to make your profile public. You could simply add some projects to your profile, and expand your profile summary to include new keywords and descriptions of your future work path. I added my brand as my job title, connected several projects, and I created a special section in my LinkedIn profile to capture and highlight my volunteer work, regardless of which employer I work for today. Although it is popular today for recruiters and job hunters, it is important to remember not everyone uses LinkedIn. Many of us create our own blog or website to give ourselves a central place to show our talents to other people. I do too. I publish portfolio pieces in different platforms because it gives me flexibility in the tools I use and the target audience. Rather than tell people go here today; go here tomorrow, I bring all my portfolio publishing together in my blog. Then I advertise that blog through my social media. On my personal business card I have three things: my blog, my brand and my email address. That is it. I experimented with adding everything else, but it just cluttered the card and the message. Giving people one place to go and check you out is an easy thing for them and for you. Last week, we started on the three exercises to Find our Direction and Find the Experts and Examples. This week we are now ready to sort through our list of targeted examples, to plan and produce a portfolio project. Sounds like a lot of dull work? Now add your own twist to motivate yourself, to put the carrot in front of your own nose. Create a learning piece for cause or an organization you believe in, for example, a place or group you would normally help or volunteer to spend time with outside of work. Doing something for a cause you believe in already will make the time fly quickly on your project. Before you know it, you’ll be setting a timer to take a break. If you tie it to a volunteer event, you’ll be setting a deadline for yourself to give and showcase your work. You’ll become highly motivated. Many of us have a fitness buddy who works out or goes on walks with us. By working on the fitness goal together, you both become committed and motivated. When you collaborate on a shared project with another peer, you are creating a small business model of a real project. Just like a business contract, it’s a good idea to discuss and write up your guidelines for the project before you begin, the expected output and your shared vision. Be specific about how much time you would each commit each week, and how you will communicate and answer questions together. Many times I’ve done this by phone and online, a virtual collaboration. In virtual, we can miss an email or communication, so there is pressure to follow through on your end of the commitment. When one person produces and asks questions, the other person is obligated to pick up and continue with the discussion or project in a certain amount of time. A good example was my project Find Your Mentor and Move Ahead, where I collaborated with a graphic artist. When we met at a local networking event, he said “I have graphic skills and software, but no content.” That’s where my content came in, my blog I had been writing in text form. Together we established the rules, limited our time together and on the project, and came up with beautiful graphics you see in this blog. In the end, we did create a project that was better than one I created alone. It was a win-win for both our portfolios. The beauty of a portfolio project is you may try new skills and tools in a low pressure environment. This can be very satisfying and helpful to your current job. For example, I recently bought and loaded the latest Camtasia and SnagIt software packages on my personal machine for a portfolio project. I do use both software programs at work; however, our work versions are about three or four years old. Our work budget is tight, so we have to make a case to justify each expense and obtain approval. It is easier to start that process at home. I can check it out the new software at home first doing my portfolio projects. After I have tried it, I can better explain the benefits, and make a case for upgrading to the new versions on my work computer. Here’s another example. For years, I’ve been an amateur photographer, mostly architecture, nature and landscapes. When I started building my own portfolio, I was able to try using my own photography, for example, the photo in the blog header. I did use my own photography for a couple of day jobs. However, the downside of that decision was that those photos became part of the body of work owned by that company. Over time, I went on to other jobs. I have no control over how those two companies use those photos today. So in several ways, my portfolio is a better place to showcase my favorite photos and graphics.